So now we’d arrived at the third phase of the process–the adventure of the shoot itself. Actors began arriving the day before from all over the country. As with every film, we shot the movie out of sequence to make the most efficient use of our time and resources, so when actors arrived they only stayed in town long enough to shoot their scenes and then they were gone again. All except David Strathairn, of course, who played the lead character and was with us for the duration of the shoot. Pre-production also is the time that the shooting schedule is revised and refined until every minute is accounted for. 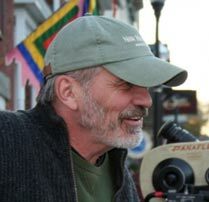 This is the job of the 1st Assistant Director and we had the best in a man named Greg Smith, who had ADed on Adaptation, Being John Malkovitch, and The Ice Storm among others (since our film his credits include Little Miss Sunshine and Sunshine Cleaning). Greg studied every location, talked at length with Aaron and our director of photography Christophe Lanzenberg, and created a game plan for the shoot that made it possible to complete the film on our very tight eighteen-day schedule with very little overtime.